Bobbi Brown Nectar Shimmerbrick. I have found almost all of the shimmerbricks to be unpigmented glitter bombs, all so far except this one. Bobbi Brown Nectar Shimmerbrick is a set of the perfect peachy shades. 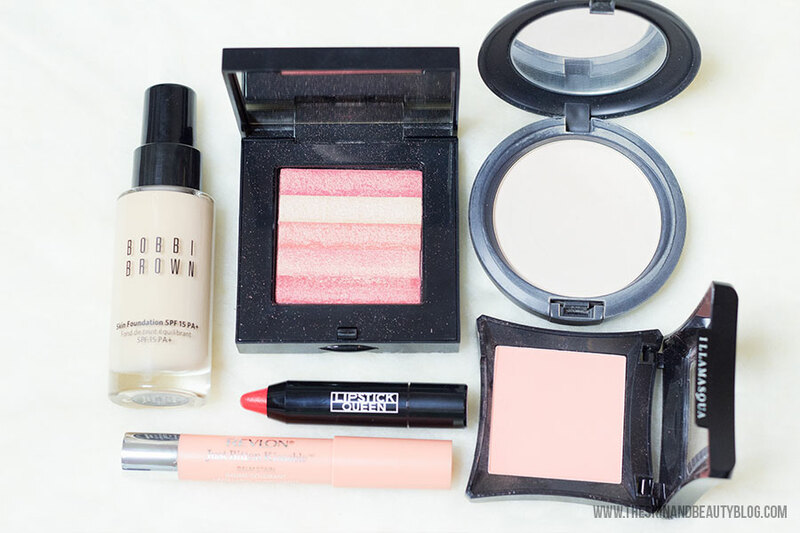 It is quite versatile - the colours are perfect for this to be used as highlighter and blush. Only one swipe on the cheeks gives you an instantly brightened look. The colours are also good enough to use individually as eyeshadow. Use a light-hand to produce a highlight and a few more swipes to use as blush. I think this will look good on almost anyone - warm and cool-toned skins alike. Illamasqua Lover Blush. Here we have a blush from Illamasqua that is the definition of peach. Illamasqua Lover Blush has no hints of pink or red or orange - just peach. It has a wonderful matte texture that translates well on the skin. It is easy to blend and despite the lack of sparkles, it gives you a 'lit-from-within' glow. Lover would work well with majority of skintones, but very dark skins would just beware that this can look a tad ashy. Overall, Lover = Love! Revlon Charm Kissable Balm Stain. I have previously reviewed and swatched this product in my post on my Revlon Just Bitten Kissable Balm Stain Collection. Among these shades I have previously swatched, Revlon Just Bitten Kissable Balm Stain in Charm is a pastel peach with a wonderful creamy texture that evolves with wear into a mid tone coral pink on the lips. It is just beautiful. It can be a little difficult to find in the shops, it's like gold! Bobbi Brown Skin Foundation in Warm Natural. I had been having a good skin day this week and I wanted my skin to look like skin ie. less coverage. This foundation was a clear choice. Read my full-length review here. MAC Blot Powder in Medium. MAC Blot Powder is my standard to-go powder to minimise oiliness and shine, and funny enough wonderfully complements Bobbi Brown Skin Foundation! Read the full review here. Lipstick Queen Chinatown Glossy Lip Pencil in Chase. This lipstick mini is new to my collection. I received it in the special Space NK massive goody bag a few weeks ago. It's a beautiful red-orange that starts a little on the sheer side but can be built up to get your desired intensity. Very pretty! So that wraps up my beauty favourites for this week. What's been on yours?